SMIDGE OF THIS: Exciting Things This Friday! And then a sweet email came through last night from Amanda alerting me that she was getting a warning splashpage when visiting my blog -- apparently my previous template hosting site was potentially distributing malware ... no bueno! That was the exact catalyst for change that I needed. She's a beaut! I'm in love. Here's the story - my grandparents and great-grandparents gifted me savings bonds when I was born. This particular type of savings bond continues to gain interest as it matures, and then, after 30 years, it maxes out. Well, since I turned 30 this year, two of the bonds stopped earning interest. After a trip to my bank (and a few tears shed over such a sentimental and meaningful gift), I cashed them out. The savings bonds, given to me by very special folks that are sadly no longer with us, covered a little more than half of this purchase. Although it was bittersweet letting go of documents that I'd had for 30 years and that were addressed to me at the house I first lived in, the small home that my parents brought me to all swaddled up and fresh from the hospital -- I truly can't think of a better way of turning that financial gift into a classic, timeless, tangible reminder of their love. Cheers to a fantastic weekend, ya'll! Edit: So many sweet compliments and questions about my new design! I selected a pre-made template from Designer Blogs and installed it myself last night. I'm no HTML whiz, but their instructions, videos, and picture tutorials made it simple. It only took about 45 minutes and two glasses of sauvignon blanc to get it perfect! Did you do the blog makeover yourself or did you have someone do it? okay #1. LOVE the new layout! did you do it yourself? or did you have some help? I'm in the market for a new layout. #2. Your bag is amazing. You'll have it FOREVER and pass it on to you daughter one day, making it even more special. So fun. and a new louie! what could be better?? congrats on the big purchase! I love the new layout and the new bag! Love your new blog look! Super cute! Did you make it? If so, you need to be in business. Such a sweet sentimental gift that you'll always remember! Such a cute new look. And a great purchase on a timeless piece! April I LOVE your new layout! And I LOVE LOVE LOVE the purse and your story :) The best thing about the purse is that when you use it every day you will be reminded of your wonderful grandparents and great-grandparents :) The sentimental aspect + the beautiful product = priceless! WOW!!!!!! What an awesome purchase! I'm jealous!! It would have taken me getting some extra cash for me to make such a big purchase too. Good for you!! Love the new look. I'm in desperate need of a new look too but I'm not sure what's going to happen with my blog. Woohoo, nice purchase! Now you will think of your grandparents and great-grandparents everytime you pick it up! :) Blog makeover looks fab! I love the new design & the new bag. You are definitely meant to have a bag like that! It looks perfect on your arm! Sorry about being MIA yesterday...I was out of pocket all day...long story, but we NEED to have those cocktails together, asap! Yay for a Speedy!! 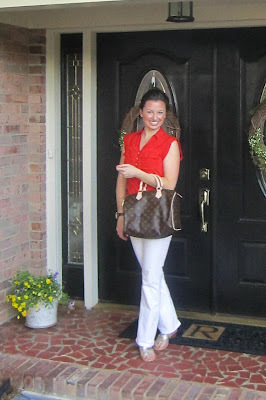 I carry my mother's vintage bag - her first Vuitton, purchased in Italy in her early 20s so it is close to 40 years old! It is still in great shape for the age, just needs a new zipper. I love the new layout (I too got the warning splashpage last night) and would love to see a post about how you did it. I finally started my blog again, still a major work in progress, but have fun with it. And yay for Speedy. Is the SouthPark store still there? I think you bought a wonderful item, so classic! love the new look! so fun & cheery! New blog layout is gorgeous! Love the ikat! Love the new layout! It is trendy, yet sophisticated! Absolutely LOVE the blog change, it's so refreshing and fun, nice work! Anyway, enjoy! And thanks for sharing the side note on the bonds. That's very sweet and you'll always remember them when using it. You will seriously have that bag for life! love the new design. and you just reminded me...i need to see how much interest my savings bonds have aquired since the last time i checked. Your blog looks lovely and so fresh...just like your new arm candy! The LV Speedy is such a great size and compliments every outfit! i LOOOVE the new look! so pretty and fresh. looks fantastic! I adore your new blog's look! I also love your special new bag. Both are stunning! The blog makeover looks fantastic! You did a great job on it. I was so saddened the day I cashed my bonds in from my grandparents. It had a handwritten note on it from them right after I was born. You did well on the handbag!! what a fantastic big girl purchase! And I am LOOOOOVING the new blog design! So fresh and fun! Love the new look April! Fabulous bag!!!! I love your new design! It's so girly! :) And that bag is to die for! Love the new look! Congratulations on the LV!! Aw congrats on the new bag and the good lookin' blog! Love it all! I know most people are commenting on your bag, but I love your outfit! It's so pretty. And your new blog design looks great!